Ask a room of preschoolers- “Who is an artist?” and you will see all hands go up. Ask the same question to a room full of educated adults and you might see one or two hands in the air. It’s not that our idea of “artist” has drastically changed, it’s that our creativity has been judged along the way, it’s that we’ve been told an alligator is green. Only green. Our schooling has not encouraged us to create and imagine. In the modern education system, it is the bottom line of test scores that has become our religion. And it is in a rare classroom where a teacher might ask, “What do you think?” Imparting knowledge, regurgitating knowledge- this has been the model. In fact, it is our very schools that tell us not to think too much (we wouldn’t want students coming up with a different conclusion than our own)! What does the child understand when we tell him that the alligator must be colored green? We tell him- there is one way to see things in the world. And thus we steal all the other worlds that exist in the mind of a child. The Kindergarten classroom has become a place of prep (we’ve got to get them ready for the big tests) instead of a valid time in and of itself, as childhood is, laying the foundation for critical thinking and compassionate feeling. 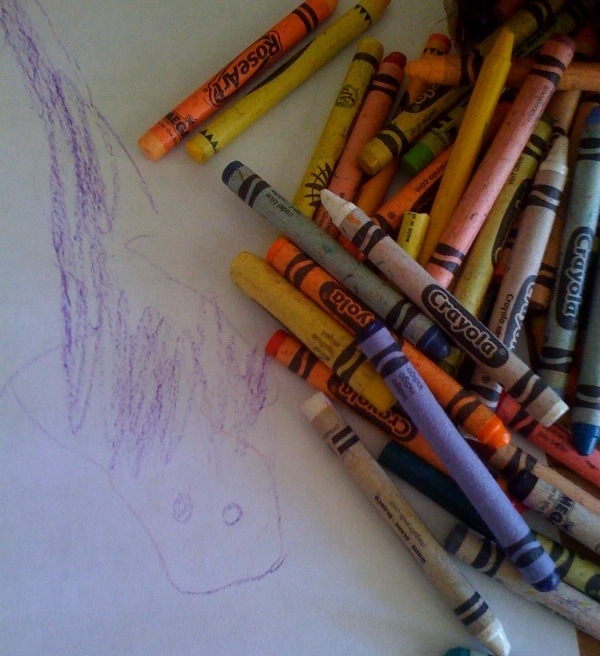 We are literally telling our children that the crayon box must be used as we say- the “correct” way; hair is not purple (or is it?) and alligators are GREEN for goodness sake! An artist, simply put, is one who thinks outside of convention. We say this is what we want- people who can think outside of the box. And yet we tell our youngest children which colors to choose out of the box. Einstein also said, “No problem can be solved from the same level of consciousness that created it.” How will our children innovate, create and find solutions to the world’s problems if they cannot go outside of the way we see it? If we give our children the freedom to think up worlds with purple alligators, they will give us a different world tomorrow. What a cool book! Thanks for sharing Brie! …A wonderful way to nurture free thinkers at a young age…I like it!